In this blog post, Gleb Tsipursky asks questions about ‘meaning’ and purpose in the lives of the nonreligious. Often religion is associated with ‘big questions’. However, his research with nonreligious and secular populations suggests these questions are more than simply religious ones. Why should we as scholars of secularism and nonreligion care about meaning and purpose? After all, meaning and purpose fall squarely within the realm of the kind of big life questions that are traditionally addressed by religion. Yet there has been much new research, in fields as diverse as psychology and history, which has addressed meaning and purpose in nonreligious and secular contexts. Before proceeding, I will describe how scholars of meaning and purpose use these terms. Michael F. Steger, a psychologist and one of the most prominent researchers on meaning and purpose, describes in a recent article how scholars of meaning and purpose define these words differently than they are used in common language. They use “purpose” to refer to a broad aspiration in life that motivates one’s everyday activities. They use “meaning” as a more overarching term to refer both to one’s life purpose, but also one’s broad comprehension of one’s life, self, and the world. However, since life meaning and purpose are used interchangeably in everyday speech, I will use them interchangeably in this article. One important reason for much of the new scholarly focus on meaning and purpose comes from research in psychology, which has shown that people who have a clear answer to the question of “do you have a sense of meaning and purpose in life” have better mental and physical health and wellbeing (Seligman). They can deal much better with both everyday life and the most challenging situations. Victor Frankl, an Austrian psychiatrist who lived through the concentration camps of the Holocaust, conducted the classic research on a sense of meaning and purpose. He described how those who had a personal sense of meaning and purpose in their lives, regardless of their religious belief, were most likely to survive and thrive in the camps. He did research demonstrating this both during and after his concentration camp experience, in his private practice (Frankl). More recent studies illustrate that people who feel that their life has meaning and purpose experience a substantially higher degree of mental well-being. For example, Steger found that many people gain a great deal of psychological benefit from understanding what their lives are about and how they fit within the world around them. His research demonstrates that people who have a sense of life meaning and purpose feel in general happier as well as more satisfied on a daily level, and also feel less depressed, anxious, and are less likely to engage in risky behaviors. An increased sense of life meaning and purpose correlates with reduced risk of heart attack, the leading cause of death in the United States, and stroke, another of the top five leading causes of death. With such benefits for mental and physical well-being, it is no wonder that a strong sense of life meaning and purpose predicts longevity. Research generally shows that those who believe in God and go to church have an overall more powerful sense of purpose and meaning in life, although some recent studies nuance these conclusions. However, is it the belief in God that creates this stronger sense of life meaning and purpose, or something else going on? Other research indicates that religion satisfies people’s desire to belong. Studies show that people have a higher sense of life meaning and purpose when they are part of a community and have strong social bonds. Likewise, people have a stronger sense of life meaning when they have an opportunity to reflect on this question, by themselves and especially together with others. Religion provides the primary opportunity for community ties and the main venue for discussing life meaning and purpose, at least in the United States. Furthermore, religion has been one of the most common sources of ritual experiences, especially in the United States. Research on rituals shows their importance in maintaining and transmitting cultural values, including what a specific culture perceives as the key elements of meaning and purpose. Scholars also highlight how rituals serve as a vital contributor to social bonding and community belonging. A meta-review of research on meaning and purpose illustrates that the important thing is simply to gain a sense of life purpose and meaning: the source of the purpose itself is not so important. Religion can be one among many channels to help someone gain a sense of life meaning. The pioneer in this field, Victor Frankl, was a Viennese psychiatrist who lived through the Holocaust concentration camps. In his research and work Frankl found that individual needed to develop a personal sense of purpose and meaning, what he terms the “will-to-meaning.” Frankl’s approach to psychotherapy came to be called logotherapy, and forms part of a broader therapeutic practice known as existential psychotherapy. This philosophically-informed therapy stems from the notion that internal tensions and conflicts stem from one’s confrontation with the challenges of the nature of life itself, and relate back to the notions discussed by by Sartre and other existentialist philosophers. My research illustrates that secularly-oriented societies have found other ways of providing meaning and purpose for their citizens through providing social institutions that offered many of the same benefits as churches do in the US. To understand how the USSR’s government helped its citizens gain a greater sense of meaning and purpose, I spent over a decade investigating government reports in archives across the Soviet Union, exploring national and local newspapers, read memoirs and diaries, and interviewed over fifty former Soviet citizens as part of my PhD research. Mike is an example of a person whose memoir I read. He described how he met regularly with friends and acquaintances from his neighbourhood in a large community centere, where he enjoyed listening to presentations about big life questions: on the meaning of life, on the nature of morality, on ethical behavior, etc, and participated in study circles that engaged with these questions in more depth. Mike sang, danced, and enjoyed musical performances there. Together with others, he volunteered to help clean up the streets and patrol against troublemakers. Through his activities, he gained social bonds and community connections and places to reflect on big life questions – all the components that make up gaining a sense of meaning and purpose. Mike’s full name is not Michael, but Mikhail, and his experience describes the prototypical experience of Soviet citizens in state-sponsored community activities. For example, the future Soviet leader Mikhail Gorbachev described in his memoirs how much he and other Soviet citizens enjoyed such events: according to him, “everybody was keen to participate” (pg. 6). The Soviet Union is typically perceived as a militaristic and grey society, with a government that had oriented all of its efforts to taking over the world. This kind of analysis is debatable, since the Soviet authorities put many resources into providing their citizens with opportunities to find meaning and purpose in life, as well as fun and pleasure – although they also certainly wanted to spread communism throughout the world, and put many efforts into this goal as well. My research indicates that the official efforts to promote meaning, purpose, and fun for citizens took place largely through government-sponsored community and cultural centers called kluby (clubs). 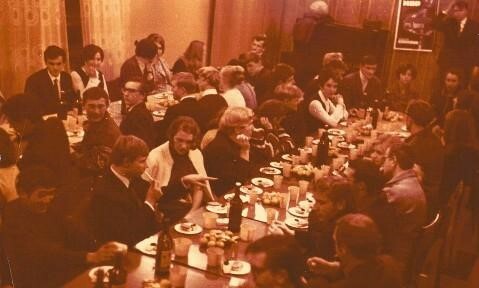 These venues, and others such as discos, in many ways replaced the social function provided by churches, offering Soviet citizens social and community connections, chances for serving others, and places to reflect on meaning and purpose in life, in a setting that combined state sponsorship with grassroots engagement. This early 1960s photograph shows a performance from a scene in a Soviet opera, named “Arkhimed,” held at a Soviet club. The photograph comes from the private archive of M. A. Lebedeva. For more on “Arkhimed,” see my published scholarly work (Tsipursky, “Having Fun”). Present-day societies with a more secular orientation than the United States have similar stories to tell, as illustrated by research on contemporary Denmark and Sweden. Most Danes and Swedes do not worship any god. At the same time these countries score at the very top of the “happiness index,” have very low crime and corruption rates, great educational systems, strong economies, well-supported arts, free health care, egalitarian social policies. They have a wide variety of strong social institutions that provide community connections and other benefits that religion provides in the United States. My research, and that of others, illustrates how secularly-oriented societies provide social institutions that offer a source of meaning and purpose. The focus on religion as the primary source of life purpose in the United States is a historical contingency, one that may shift over time. Indeed, there is a growing number of “nones,” people without any religious affiliation in American society, especially among younger adults. Many nones, and especially college aged youth, are seeking for answers to the question of life purpose that do not necessarily include a G/god as part of the equation. Likewise, there are growing numbers of secularly-oriented venues through which they might find the answers to their questions, such as local affiliations of the American Humanist Association, American Ethical Union, Secular Student Alliance, Center for Inquiry, and others. Only time will tell how these trends will evolve in the future. This entry was posted in Discussion, NSRN Blog, Reflections from the field and tagged Gleb Tsipursky, Secular, secularism, soviet atheism, Wellbeing. Bookmark the permalink.